Metropolitan United Church c. 1925, St. Michael’s Cathedral on Bond Street in the background. Toronto Archives, F 1568, Item 04641. Metropolitan United (Methodist) Church on Queen Street East was perhaps the grandest church that the Methodist ever built in Canada, deserving its nickname as the “Cathedral of Methodism.” The congregation was founded in York (Toronto) in 1818, its first services held in a log cabin on the south side of King Street. By 1833, a larger building was required and land was purchased at Toronto Street and Adelaide Street East (then called Newgate). On this location, they constructed a Neo-Georgian style structure. However, because the congregation continued to expand, in 1868, another site was sought, on the north side of Queen Street East, between Bond and Church Streets. The property the congregation acquired had an interesting history. Known as McGill Square, it was part of “park lot #7,” granted in 1793 by Lieu. Governor Simcoe, to Adjutant John McGill of the Queen’s Rangers. In the mid-1790s, McGill built a large Regency-style cottage on the southern portion of the land, near Queen Street East. In 1842, McGill subdivided and sold much of his estate as small lots. However, the property surrounding his cottage he reserved as a public square. The McGill family continued to reside in the cottage until 1870, when they sold the land to the Metropolitan congregation for $27,846. This occurred despite its designation as a public square, to the dismay and anger of many of the residents of the city and the City Council. The site was highly favoured by the congregation, since many of its members lived on Jarvis Street, which in those years was an upscale neighbourhood. The committee that was designated to oversee the building of the new church authorized a competition for its design. They offered $200 and $100 for the best two submissions. However, the proposals were considered too expensive, so the committee turned to the architect, Henry Langley, to submit a plan. He accepted, events progressed rapidly, and the cornerstone was laid on August 24,1870, by Edgerton Ryerson. Langley designed a church that resembled the French Gothic style of the 14th century. Its foundations were constructed of stone quarried in Queenston and Georgetown, the facades built of white brick, trimmed with Ohio cut-stone. There were two towers above the side entrances, both 130’ in height. The dimension of the structure were an impressive size, 216’ long and 104’ wide. The tower over the main entrance possessed enormous pinnacles. The roof had designs created by employing various colours of slate rock. The nave was extensive, with two side aisles, but no centre aisle. Surrounding the interior on all four sides was a balcony, 17’ wide, supported by cast-iron columns. There was a large chancel at the north end of the nave, and an enormous organ containing 3315 pipes positioned above the pulpit and the choir stalls. The seating capacity of the church was 1800, making it one of the largest churches in Canada. William Dendy in his book, “Lost Toronto,” described the ceiling as, “. . . . a tent-like canopy of Gothic vaults, executed, complete with ribs and bosses, with plaster that was highly frescoed in stylized foliage patterns.” Construction on the cathedral was completed in 1872, and dedicatory services were held in April of that year. The total cost of the church was $135,000, which included $6500 for the organ, which at the time of the opening was not yet functioning. As the spring season progressed, the property surrounding the church was landscaped. A carriageway was built from Queen Street to the church’s main entrance, and it continued east and west to surround the building. This allowed carriages to enter and depart the square without turning around. In 1874, a cast-iron fence in the Gothic style was commissioned to enclose the square. Designed by Langley, Langley, and Burke, it was slightly over 5’ in height. However, due difficulty raising funds, it was not installed until the following year. Despite being enclosed by a fence, the church allowed McGill Square to be used as a public park, to be enjoyed by everyone (unfortunately, the fence was removed in 1961). During the early-morning hours of January 30, 1928, the church caught fire and was almost completely destroyed, save for the tower and part of the narthex. The congregation decided to rebuild, and J. Gibb Morton was given the commission. The tower and the front facade of the old church were retained, and Morton created a church that resembled the one that had burnt. Its narthex, nave, side aisles, and transepts, were in the traditional style, but there was no balcony. The altar and altar table were reached by steps. In 1926, the Metropolitan Methodist Church joined with the United Church of Canada. 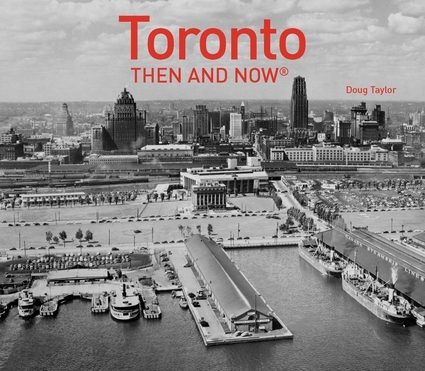 Note: Much of the information for this post was derived from William Dendy’s book, “Lost Toronto,” published by Oxford University Press in 1978. Advertisement for the laying of the cornerstone in 1870, Toronto Public Library. View of the church in 1872, from Shuter and Church Streets. The north and east facades are visible. Photo from the Toronto Public Library, r- 5390. The Metropolitan Methodist Church in 1873, the camera positioned on Queen Street, pointing to the northwest. The tower has High Victorian Gothic pinnacles at the top. Toronto Public Library, r- 5393. View looking southeast from Bond Street in 1873 at the north and west facades. The patterns on the roof created by varied colours of slate are visible. Toronto Public Library, r- 5392. Sketch drawn on stone by G. P. Alfred in 1875. Toronto Public Library, r-5415. Photograph coloured by water colour of a wood engraving by F. Schell, dated 1881. It looks north on Bond Street from Queen Street. Toronto Public Library, r- 5384. Interior of the church in 1887, gazing north toward the pulpit, choir loft, and organ. The balcony surrounds the interior, and it includes the choir loft. The pulpit is below the balcony. There are two side aisles, but no centre aisle. Toronto Public Library,r- 5395. View of the Gothic-style fence around McGill Square in the 1870s. Photo from Eric Arthur’s book, “No Mean City.” Fence was removed in 1961. The camera is pointed southwest from the northeast corner of Church and Shuter Streets, in 1890. In the distance is a streetcar on Church Street, travelling north. Ontario Archives, 10001873. View in 1890 looking north on Bond Street, the church on the east side of the street. To the north is St. Michael’s Cathedral. Toronto Public Library, r- 5420. View of the interior in 1899, looking north. This photo provides an exceptional view of the ceiling. William Dendy in his book, “Lost Toronto,” described the ceiling as, “. . . . a tent-like canopy of Gothic vaults, executed, complete with ribs and bosses, with plaster that was highly frescoed in stylized foliage patterns.” Toronto Public Library, r-5445. View gazing northwest from Queen East and Church Streets. By the turn of the century, the streetscape was cluttered with electric wires and hydro poles. The idyllic pastoral scenes of the 19th century had faded into memory. Toronto Public Library, r- 5404. This etching of McGill Square, c.1910, depicts the landscaping of the square and the carriageway from Queen Street. The houses on Church Street are visible to the east (right-hand side) of the church. Toronto Public Library, Baldwin Collection, JRR 4551. This artistic photo was taken in 1920, showing the south and west facades of the church. Toronto Archives, F 1231, Item 1036. This charming sketch was created by Harold Pearl in 1924. It is a view of the tower of Metropolitan Methodist from Victoria Street. The rear of the houses on Bond Street, which back on to Victoria Lane, are visible. The sketch was exhibited at the Art Gallery of Ontario in March of 1925. Photo from the Baldwin Collection (979-35) of the Toronto Public Library. The south facade and the tower after the fire of January of 1928. Photo taken on May 2, 1929, when the nave had already been rebuilt. Toronto Archives, Fonds 1266, Item 16613. The tower encased with scaffolding on July 2, 1929 after the fire of the previous year. Only one pinnacle on the tower survived. Note: the High Victorian pinnacles of the 1870-church were never duplicated on the new church. Toronto Archives, Fonds 1266. Item 1717. The new Metropolitan United in the spring of 2014.